“It’s very upsetting when people come and try to kill you. We’ve had two funerals already. But when you have 70% of wines under cork, I think you can see that after fifteen years the debate has been resolved,” Carlos de Jesus started our meeting at Amorim. I had taken advantage of my trip to Douro and the Dão to visit Amorim’s plant just to the south of Porto. 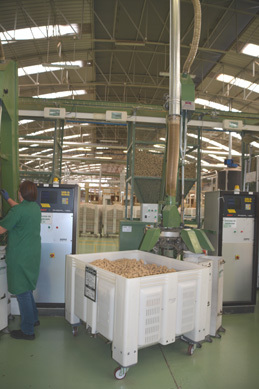 Half of the world’s corks come from Portugal, Amorim has more than a third of the market, and roughly two thirds of business is in wine stoppers. 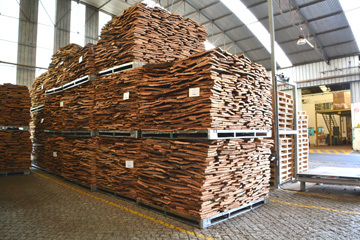 There’s a plant farther south, near the forests, when the first processing is done, and then the sheets of cork are sent to the plant in the north to be turned into corks. We visited the plant where both agglomerated corks (made of small particles) and solid corks (punched out from the sheet) are made. It’s actually technically easier to remove TCA from agglomerated corks, because the broken up particles can be heated to extract it before they’re stuck together into the cork. There’s a whole hall with a vast series of machines taking in raw cork and spewing out finished corks. To make solid cork, the sheets are cut into bars of the right width, and then the corks are punched out. There are two separate parts of the plant devoted to this, one automated, one manual. Watching the operators of the manual line seems like a time warp. They hold the bar in a machine, operate a treadle to punch out the cork, and then move the bar along to punch out the next cork. This seemed old fashioned compared with the automated equipment, but Carlos explained that the operator gets better results, just like manual grape harvest is better than mechanized! After visiting the plant, we walked over to Amorim’s research facility, in a small building close by. The R&D department was created in 2000. A main objective is to find solutions to the TCA problem, but they’ve also been investigating the route for oxygen to enter bottles. The lab does Q & A, testing 800 samples per day for TCA. This requires 24 hours to soak the cork and then 24 hours to get results. So it’s a check, but they have to wait 48 hours to release each batch. 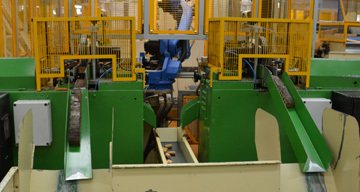 The latest system is NDtech, which analyzes individual corks. (If not secret, it’s certainly more closely guarded as no photos were allowed here.) 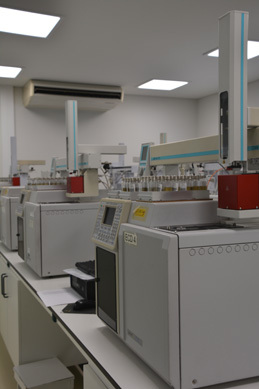 Eight years in development, NDtech basically takes the gas chromatography system to automated speeds. A single production line can handle about 15,000 corks per day, and it costs 15¢ per cork. It was a major feat to automate the equipment to this point, but capacity is still limited. There will be about 15 million NDtech corks this year and 60 million next year, which is probably way below demand. “Looking at individual corks is the holy grail. NDtech analyzes individual corks, but I doubt that we’re going to apply it to billions of corks. We’ll start with 50 million corks and then we’ll scale up. We’re not here to defeat TCA and go out of business. We need to defeat TCA and stay in business,” says Carlos. When Should You Send Wine Back at a Restaurant? I hate sending wine back at a restaurant. Of course I will do this when a bottle is flawed, but there’s always the potential for some disagreement or unpleasantness. My working rule is that this is appropriate only when the wine is clearly flawed, not merely because I don’t like it. Usually this is because the bottle is corked, and in the vast majority of cases the sommelier accepts immediately that the bottle is defective, but occasionally there is a sommelier who doesn’t recognize the taint and is awkward about it. But I was brought to a new question this week by a wine that was so poor – although technically it was not flawed by being corked or oxidized or having any other single identifiable defect – that I wondered whether being completely atypical should count as a reason for rejection. Increasing problems with premature oxidation of white Burgundy have made this, my staple when I want a white wine in a restaurant, more of a risky venture when the wine is more than a year or so old. Once again, most sommeliers will recognize madeirization as a flaw, but from time to time I’ve had difficulties with this, especially in France. “These are the typical aromas of the vintage,” a sommelier explained patronizingly to me at a grand restaurant in Provence when a white Burgundy was madeirized. As politely as I could, I said that I had a cellar full of that vintage and none had this problem. With very bad grace, he agreed to take the bottle back, but warned me to order a different vintage, because all his wines of that vintage had the same problem. The storage conditions must have been terrible. These days I have taken whenever ordering a white Burgundy to asking at the outset whether it has any problem with oxidation. Often enough a sommelier will say there have been problems, and advises me to choose something else. But having asked the question, at least I then feel free to send the bottle back if there is any taint by oxidation. Given the erratic nature of cork taint, there would not be much point in asking whether a wine is likely to be corked, but even with this most easily recognizable flaw, there can be doubt. When a bottle is well and truly tainted, it’s a fairly easy decision to reject, but this can be more difficult when there’s a subthreshhold level of taint, enough to suppress the fruits but not enough to show any clear evidence of TCA on the nose. Actually, I think this is a killer for the producer: if you don’t know this particular producer, you can easily conclude that he’s no good rather than that the wine is flawed. In such cases I have usually felt obliged to stay with the bottle. When you have a clear expectation for the wine, you may be able to say fairly that it is flawed. But given people’s widely varying sensitivities to cork taint, there can be problems in marginal cases. My most amusing incident was at the restaurant Les Bacchanales in Vence, where a bottle of a recent vintage white Burgundy was suspiciously lacking in fruits. When I expressed concern, the waiter took it over to the diner at the next table, who was a local dignitary on the wine and food scene. We could hear him saying, “no, I do not see any problem here,” which the waiter duly came back to report. As the taint was slowly becoming more evident, I stood my ground, and indeed a substitute bottle was vastly better, A few minutes later the chef came out. “I do apologize,” he said, that bottle is terribly tainted. “I would not even cook with it.” So here we had a living demonstration of variation in sensitivity, increasing from the food writer to the chef, where I was uncomfortably the piggy in the middle. That’s why it can be so difficult. This week I am visiting producers of Cabernet Sauvignon in Napa Valley as part of the research for my next book, Claret & Cabs. My usual habit is to try to perform a reality check at dinner by having a wine that we have tasted at a producer, to see whether experiencing a whole bottle with food gives me the same impression as a tasting. However, having dinner at the Auberge du Soleil, I was so offended by the markups on the Napa Cabernets that I decided to try something else. 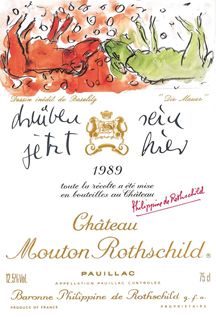 My usual experience in wine regions is that restaurants showcase the local producers, and while it would be naive to expect to find bargains on the wine list, often there is some wine, perhaps an older vintage that hasn’t been terribly marked up, that offers an interesting experience without completely breaking the bank. Slowly I have become adjusted to markups moving from two fold to more than three fold, but at over four times retail prices, I draw the line. One example makes the point. The Spottswoode Napa Cabernet 2000 is $360 on the list at Auberge – but the restaurant at Domaine Chandon has it at $160. Now I’m prepared to believe that expenses are higher at Auberge, but not that they justify a price of more than double compared to another good local restaurant. The wine averages around $80 at retail, so the markup at Auberge is well over my line. So I did something I have not done before and ordered a wine from another region altogether, in fact from Burgundy, as I thought a lighter style anyway would fit better with our particular meal. This was the Nuits St. Georges 2005 from Confuron-Cotetidot. I think it’s a reasonable expectation that in 2005 any decent producer should have been able to make an acceptable wine at communal level. But this was a throwback to the old days of Nuits St. Georges, and I do not mean that as a compliment. It had no nose at all and no fruit could be detected on the palate. If this had been a Bourgogne AOC, I would have shrugged and said that I expected a better result in this vintage. But this tasted (if the word taste can be used at all in conjunction with this wine) as though it had been overcropped to hell. I hesitated, but decided that as it had no detectable flaw, it would be unfair to send it back. However, when the wine deteriorated in the glass to the point that all you could taste was a medicinal acidity, I called over the sommelier and asked her to taste it. “Ah it has racy acidity, a bit surprising for 2005,” she said. I explained that my problem was more with the lack of fruit, and she wondered whether decanting would help. I did not feel that decanting could bring out nonexistent fruit, however. She offered to bring another wine, but I did not feel like starting another bottle at this point (and I had somewhat lost confidence in the selection of Burgundy), but we ended up with a couple of glasses of the Beaux Frères Willamette Pinot Noir from 2008 (surprisingly taut for this producer and vintage), but definitely wine as opposed to the previous mix of acid and water. No nose at all. Rather characterless and lacking fruit on the palate, seems dilute and overcropped. No obvious flaws, but only a thin somewhat medicinal, slightly acid, quality to the palate. Only fruit character is an amorphous somewhat flat medicinal note. Would not be a credit to the Bourgogne AOC. 75 points.